External monitor - anyone stacking vertically? Discussion in 'MacBook Pro' started by skiltrip, Mar 28, 2011. Does anyone else use an external monitor with their MacBook Pro, but keep their lid open with the external above the MacBook screen? I do this and do audio work mostly. Works well for me. Edit/Arrange window on top, and the mixer on the bottom (or email, if I'm corresponding with people on an audio project). Yep. I've been doing this for at least the last 10 years for SWD. I could never get used to the left/right rotating my head all day thing. I much prefer a simple glance up/down. I find it better to have them side by side, but then again you need a laptop stand and a keyboard+mouse. my ideal setup is to have the display mounted above the laptop but in portrait mode. I just haven't figured out how to hang it up yet, since my desk isn't two tiered. I'll tell ya one thing, Logic sure has made those Amp Designer graphics a space hog. Wouldn't it be great if you could reduce them all to thumbnails and stash them in a corner. Can you assign the screens to be up and down as well, so when you move your mouse to the bottom of the top screen in comes in the top of the bottom screen? Yup. That's exactly how I have mine set up. Can you guys post pictures of your setups? Strangely enough I just set mine up that way for the first time this morning. I'm finding I like using the trackpad more and more even while at a desk and rather than purchasing the bluetooth trackpad I've mothballed the keyboard and mouse and am now just using the macbook for input and secondary screen, and an LCD directly above (and slightly behind) as the primary. This is the setup I had for a while. Worked great, but I eventually got sick of having to unplug everything from my Macbook to take it anywhere. I also no longer have that desk, so now I only use the external when I need it. 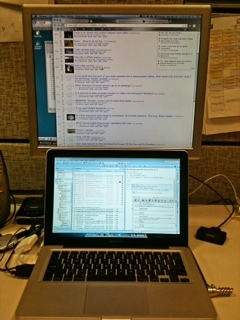 If you have a cinema display, you could do this. Disregard the part about sideways hdds. If you do, be careful. I've heard HDDs don't do so well for long being sideways. An SSD of course would be fine though. Are you kidding? That's not even close to being true at all. I stand corrected. I read it on a semi-legit site a few days ago, a quick google'ing would have told me that this is false.